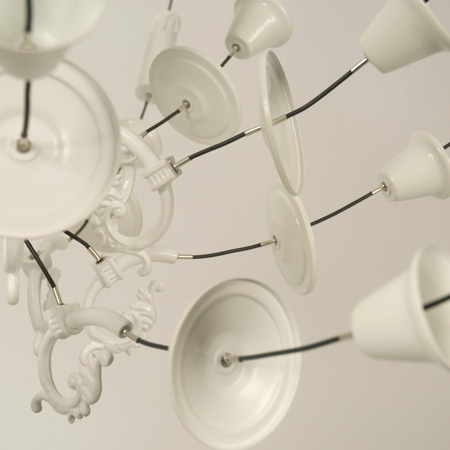 Young Dutch designer Ward van Gemert will present his Exploded chandeliers at Mint Gallery in London from today. "The deconstructed parts of a used chandelier are reconstructed into a new and modern chandelier," says van Gemert. Material: second-hand brass ball crown chandelier, electrical wire. The deconstructed parts of a used chandelier are reconstructed into a new and modern chandelier. The electrical wire is used to lit the light bulbs, but also as construction of the new chandelier. Story: In 2006 I graduated as a product designer at the st. Joost Arts academy in Breda, the Netherlands, with a series of three imaginary chairs. To create these chairs I saw ordinary chairs into pieces, which were hung with wires to the ceiling. The pieces were positioned in such a way the existing chairs transformed (morphed) into three completely different chairs. I called these new chairs ‘exploded chairs’. My ‘exploded chairs’ were stripped of their function and created as an academic project. With my new designed ‘exploded chandeliers’, I used the same method to create new images, but now I added function. The use of electrical wire both in a functional and in a constructional manner, makes this design modern and new. With this way of designing, I want to make every day objects special/ noticed again. An ordinary, often overlooked, product is used to make a new design. Due to my interventions one image can generate thousands of other images. With my way of designing I want to surprise both user and viewer with beautiful images and at the same time increase the functionality of an existing product, while visually preserving the past in new designs.